Looking for a bus in Highland Park? Chicago Charter Bus Company has access to hundreds of buses to take you to Rosewood Beach, Heller Nature Center, and more. In Highland Park, the walkable downtown makes life pretty breezy. About a half hour or less outside of Chicago, you have the perks of a safe suburban neighborhood and the proximity to extra entertainment in the city. Though, like most suburbs, most of the big action happens in the big city. For those moments you’re planning for group travel from Highland Park to Chicago or the surrounding areas, consider scrapping the carpool idea and make everyone’s lives easier with customized rentals. You can rent small, medium, or large buses to accommodate your group—no matter your final destination. One of the best parts about our Highland Park rentals is the ability to personalize your bus. A slew of impressive amenities are available to fit any type of passenger. Adding free WiFi to the cabin, for example, might delight everyone from business professionals to high schoolers. For passengers that like their space (football teams, perhaps? ), you can include extra legroom and reclining seats. For wedding guests being shuttled to the reception at Meson Sabika, adding high-quality audio is a smart move to get the party started. No matter your crew’s size or preferences, there is a perfect bus in our fleet for you. Our Services page gives more information about the occasions for which we rent out coaches. You might be surprised at how many different kinds of clients we serve! From sports teams and fans attending games to wedding planners, Fortune 500 companies, and elementary school teachers, if you need modern and reliable group travel in or near Highland Park, we’re your people. Need transportation to another Chicago neighborhood? With service in Elmhurst, Northbrook, Rosemont, and more around Chicago, we're your #1 choice for group travel in the area. Securing safe transportation for multiple people can be tough, but it doesn’t have to be. When you book with us, the process is extremely simple. How’s it work? We’re glad you asked. First, you can call us at your convenience at 312-667-0906​ (we’re waiting by the phone 24/7). Then, you’ll tell us your ideas, needs, and/or questions about Highland Park bus and minibus rentals. 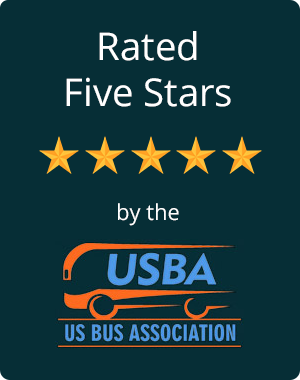 From there, your booking specialist will survey the fleet to find the best bus (or buses) to match your criteria at the best possible price. You’ll get a quote ASAP, and you can book as soon as you want. It’s that easy! Let’s get you on a snazzy set of wheels, shall we? Call us today and count this to-do as done!